Andre, a Standard Poodle, presented for lethargy, inappetence and shivering on the sofa. Myofascial exam revealed a dog that was tense and painful from head to tail along his back, refusing to turn his head or have his hind legs manipulated. Improvement with massage and acupuncture was evident after his first treatment and continued to improve with subsequent treatments. Medical acupuncture for veterinarians allowed Andre to return to his normal routines and his work as a therapy dog. 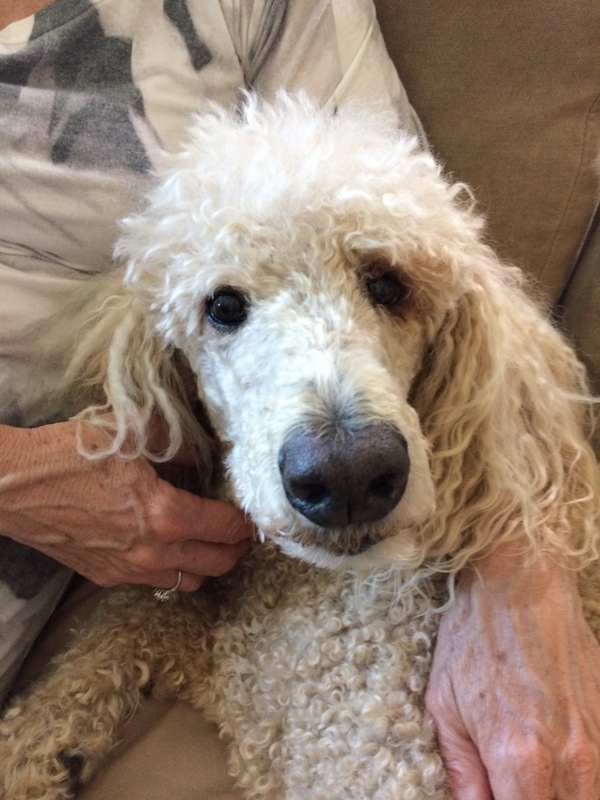 Andre is slightly underweight 10 year old neutered male Standard Poodle who presented for lethargy, inappetence, and staying on the sofa for the past two weeks. The owner stated that he appeared depressed. Andre works regularly as a certified therapy dog. He has not been able to work for the past two weeks. He lives with a 13 year old Labrador and a very feisty, large 1.5 year old female Standard Poodle, Evie, who enjoys rambunctious play with Andre as her, “Punching bag”. He has a history of injuring his neck in 2015. He ran after a squirrel, reached the end of his leash and jerked his neck. He was seen by his regular veterinarian who treated him with an injection of Dexamethasone, oral Prednisone, and Methocarbamal plus strict rest. Andre recovered well from that incidence. He’s worn a harness versus a collar ever since. Andre has always been a picky eater, but now he’s not eating at all and has lost weight. Andre has been taken for a physical exam and blood work with his regular veterinarian, who found no abnormalities. Andre appeared depressed but alert and responsive to commands. His eyes were within normal limits except for two very large chalazions on superior lid of left eye. Heart and lungs were within normal limits, as was his abdominal palpation. His neurological exam was normal. He appeared stiff when he stood. He had a stilted gate, was holding his head down, and his neck stiff and extended. He would not flex his neck laterally or dorsally, but was willing to lower his head for a treat. Myofascial palpation revealed taught bands and sensitivity to light touch along the later side of his neck bilaterally, between cervical vertebrae 3 to C6. The tenderness was evident along the thoracic and lumbar spine between 5th thoracic and the lumbosacral joint. He had tight bands in his shoulders, especially on the left side. The left coxofemoral joint was painful to extension. Tense ropey bands were found in the muscles of both hind legs, but much worse on the right. Radiographic images revealed degenerative joint disease (DJD) between the facets of C3-4, C4-5, C5-6, T6-7, T9-10 and the left coxofemoral joint. Popping was noted when the left stifle was extended during ventrodorsal radiographs of his pelvis, but stifles appeared within normal limits on both VD and lateral views. Very slight laxity was noted bilaterally during anterior drawer test. Initially Andre was too tense and painful to allow acupuncture. So, I started with gentle effleurage followed by petrissage to increase parasympathetic tone, decrease stress and release myofascial restrictions. Acupuncture was started the following day. I started with a general approach of decreasing sympathetic and increasing parasympathetic tone. Fine tuning treatment with regional, local and specific treatment of trigger points and taught bands. Bruising, DJD or herniated disc from previous, or recent trauma to cervical area. DJD or herniated discs involving thoracic intervertebral or lumbosacral joints. DJD due to hip dysplasia of the left coxofemoral joint. Possible cranial cruciate ligament tear of either stifle. Recent muscular and connective tissue trauma to cervical and shoulder areas due to Evie. DJD at the above mentioned intervertebral joints secondary to history of old neck trauma. Herniated discs cannot be ruled out. Hip dysplasia/DJD of left coxofemoral joint. Tight bands and trigger points due to compensatory action in other three legs. Tight bands and trigger points due to underdeveloped musculature surrounding stifle joints. Abscessed carnasal tooth, which was extracted, was found to be contributing to tight bands and trigger points in the cervical and shoulder areas. The following points were all dry needled unless otherwise stated. I used the holistic points of Governor Vessel 20, GV14, Bai Hui, Stomach (ST) 36, Large Intestine 4 and LI 11 to increase parasympathetic and/or neuromodulate sympathetic tone. Proceeded to regional points Gall Bladder 20, GB 21, GV14, Bladder 10, BL 11, Lung 7 and LI 11 for neck pain. Back and pelvic regional points included Bai Hui, BL 54, GB 29 and GB 30 (hip triad) bilaterally, or unilaterally assuming a crossover effect to the contralateral coxofemoral area. ST 36 and ST 34 were used for stifle pain. BL 21, stomach Shu point, and GV 25, which was lasered, were used to stimulate appetite. Local neck pain was treated with cervical spinal nerve points along the omotransversarius muscle stimulating nerve roots from C3 to C7. BL 15 through BL 20, affecting thoracic spinal nerves between longissimus and iliocostalis were used to treat localized back pain and taught bands based on myofascial exam. BL 27 and BL 28 affecting sacral spinal nerves were used to treat gluteal pain. Trigger points and tight bands in trapezius, serrastis ventralis, supraspinatus, infraspinatus, gluteals, biceps femoris, semimemranosus, semitendinosus, and startorius were treated with local dry needling and trigger point deactivation. Electroacupuncture, alternating 4 Hz and 100 Hz for 20 minutes, was added between cervical spinal nerve point C3 and GB 21 bilaterally, and between GB 29 and GB 30 on the left, which were areas that did not improve dramatically after two weeks of dry needling alone. After two more weeks of biweekly treatments, they were decreased to once weekly and tapered. He is currently treated once a month for his arthritis, and as needed for trauma from Evie. Effleurage and petrisage were used following each acupuncture session. Increased walking on irregular surfaces (sand), and stepping on and off curbs is being used to strengthen his hind legs. Andre responded well to dry needling for many of his issues, but some areas needed electroacupuncture. I used alternating 4 Hz and 100 Hz, because I was not sure whether the resistant pain was acute, or chronic. Neck flexion to the left improved 80% and to the right 50% with dry needling, massage and separation from Evie. With the addition of EA it improved to 100% on the left and 90% on the right. His stilted gate in the rear also improved with the addition of EA. Andre’s appetite also increased with treatment, though he’s still a picky eater. I learned that the addition of EA can result in improvement to areas resistant to dry needling. An abscessed tooth can cause tight bands and trigger points in the neck and shoulders. So check the teeth! Starting your initial visit with massage decreases stress, increases trust, and releases myofascial restrictions allowing the patient to be more receptive to acupuncture. Acupuncture is a great adjunct treatment for arthritis and trauma, or when animals need an alternative form of treatment, such as animals where oral anti-inflammatories are contraindicated. Narda Robinson, DO, DVM, MS, FAAMA, Medical Acupuncture For Veterinarians lecture notes and clinical intensive, April 2017.